Hamas says Israel is negotiating for release of soldiers, Goldin family says no official news, pushes gov't to turn the tables on Hamas. The family of fallen IDF soldier Hadar Goldin spoke on Saturday night about the reports that Israel is negotiating a prisoner swap with Hamas. 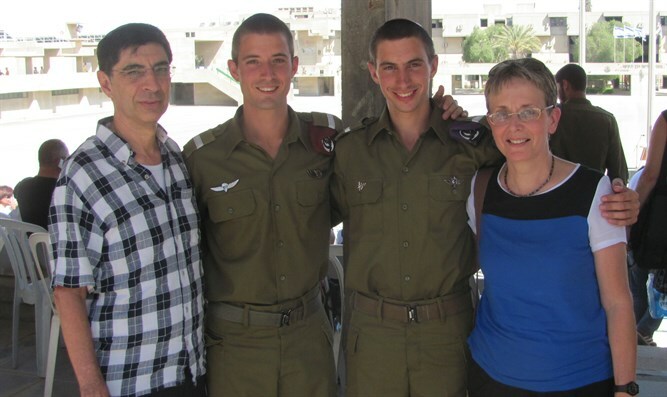 Hadar and his fellow soldier Oron Shaul fell in 2014's Operation Protective Edge. Their bodies are still being held by Hamas. "For the past three years, we have experienced much suffering and disappointment with regards to our requests that Hamas return Hadar to Israel and to our family," they said. "As a family, we have not received any official notifications regarding negotiations with Hamas, and we continue to pray for Hadar's return." "We continue to do our best to convince the Israeli government to change the equation. We want the government to turn holding Israeli soldiers and civilians from a treasure to a burden for Hamas. As a family, we receive our information only from official Israeli sources. "We cannot play into Hamas' hands and into its system of misinformation." Earlier on Saturday, Hamas sources said the terror organization was very close to an "information deal" with Israel, in which Israel would free convicted terrorists from prison - including some of those recaptured after they were released in the "Shalit deal." Hamas also said that other than the Shalit deal terrorists, any deal would include releasing female and child terrorists, as well as imprisoned Hamas officials. In return, Hamas would give Israel information on the two Israeli soldiers in its hands. According to Hamas, such a deal would accelerate a deal in which Goldin and Oron would be released. The Hamas officials also said that during the second stage of the deal, Hamas would insist Israel free Fatah official Marwan Barghouti and Popular Front for the Liberation of Palestine Secretary-General Ahmed Saadat.